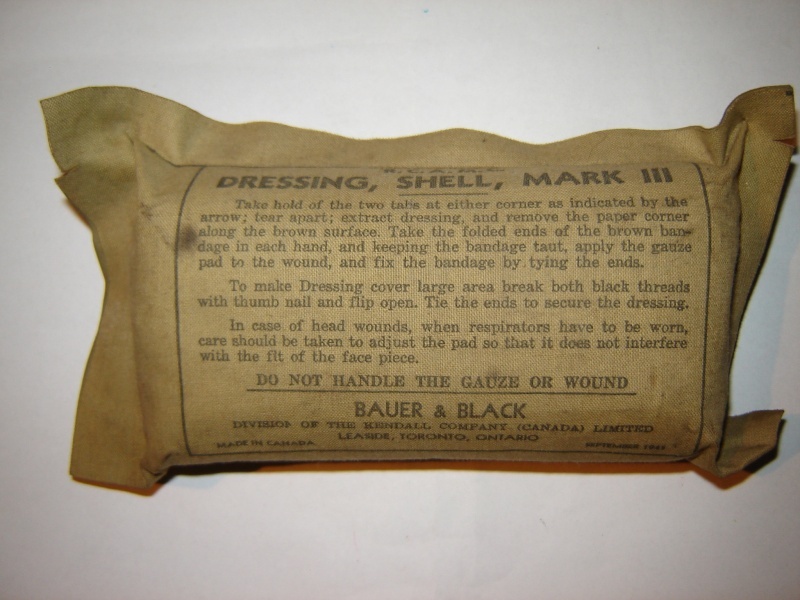 Shell dressings were a type of bandage with a gauze pad and a safety pin for fastening around the site of an injury. 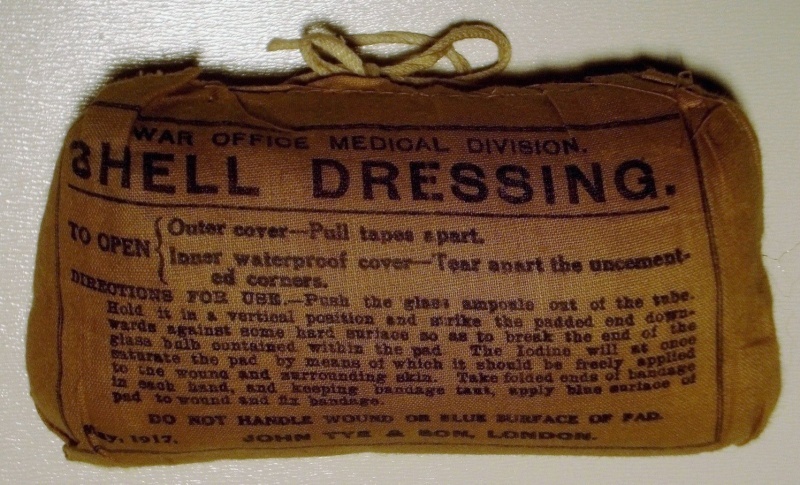 Introduced in 1916, these dressings were issued to personnel in the Royal Army Medical Corps. 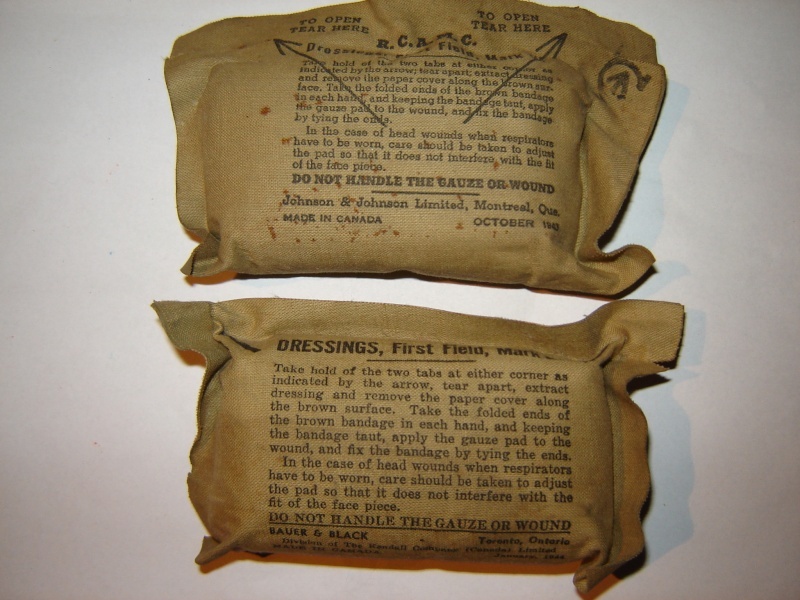 The bandages were protected in a waterproof covering which, in turn, was wrapped in a cotton package. On this outer layer were instructions as well as a makers mark and date of manufacture. 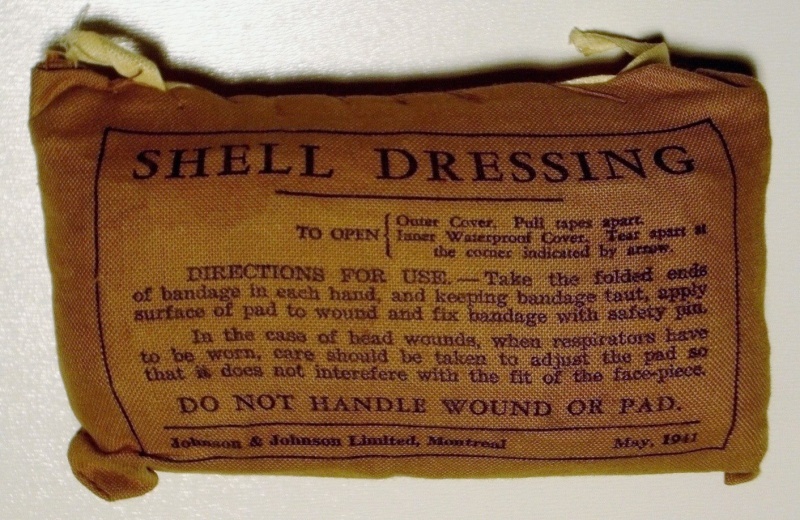 By the Second World War, shell dressings were made in many parts of the Empire. 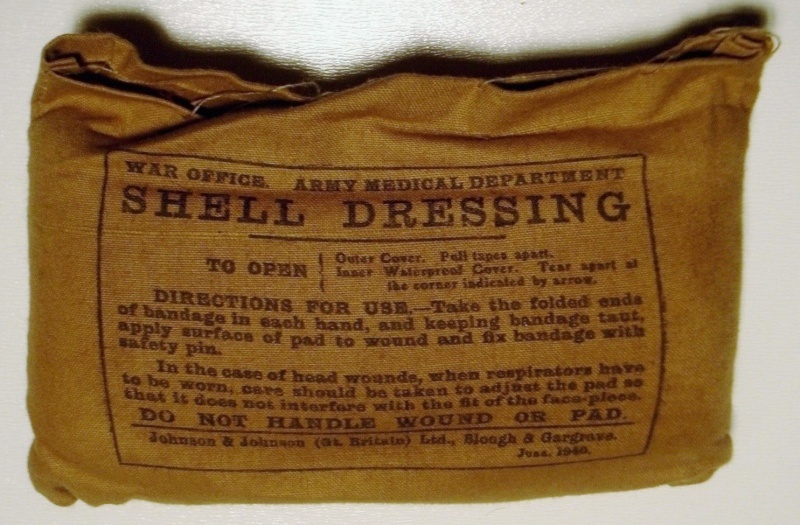 Starting in May 1917, an Iodine Ampoule in a cardboard tube was included in the shell dressing. By the Second World War, the Iodine Ampoule was no longer included. 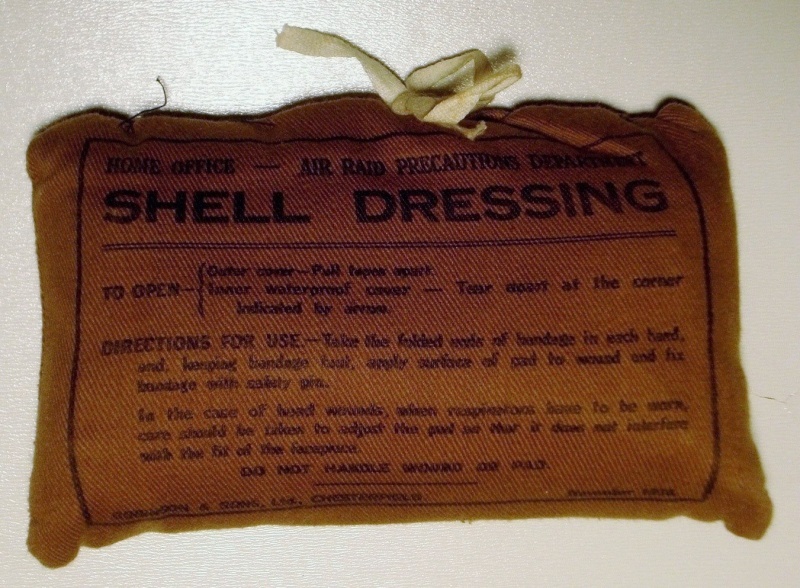 This shell dressing was made specifically for the Home Office Air Raid Precautions Department in the late 1930’s. They were issued to Civil Defence personnel for the casualties from the massive bombing raids expected in the coming war. 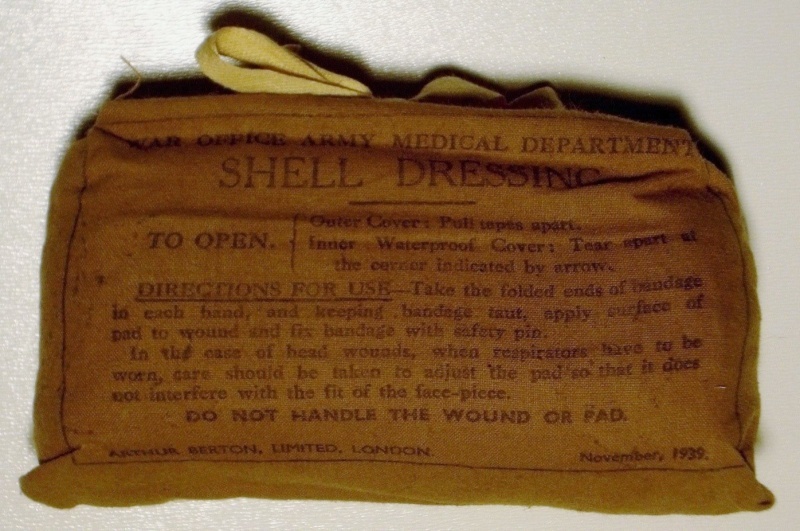 An army shell dressing issued by the War Office. 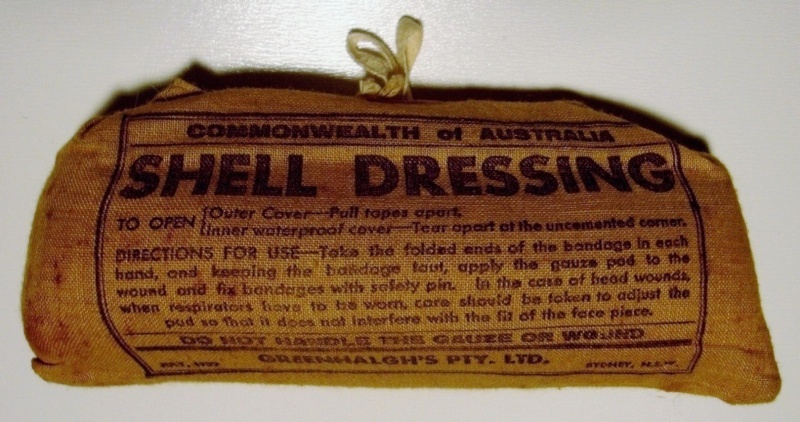 An Australian shell dressing of pre-war manufacture. 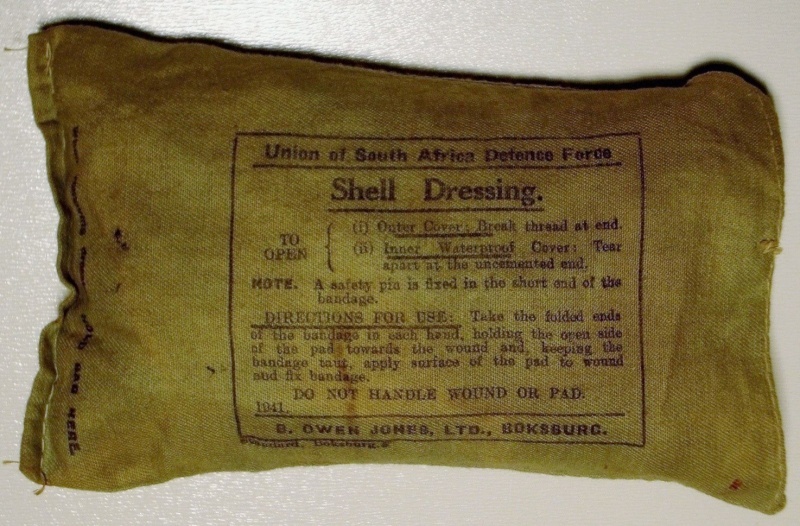 Another army shell dressing issued by the War Office. 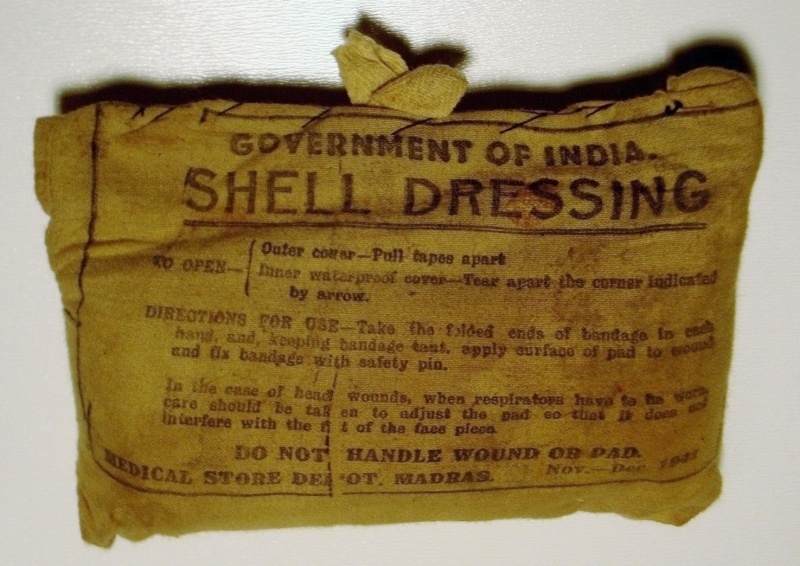 Like many Indian-made items, this shell dressing is very rough in its construction. This South African-made dressing differs from the British pattern by opening on the side rather than the top. The instructions also lack a section on ‘use with respirators’. 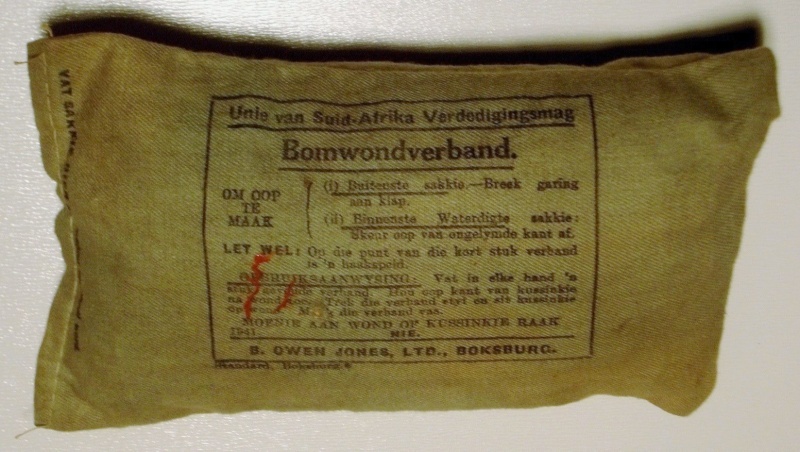 South African-made dressings also included a set of instruction in Afrikaans for the UDF’s Afrikaner population of Dutch-descent. The fact that this is a Canadian-made dressing is evident by its maker ‘Johnson & Johnson Limited, Montreal’. 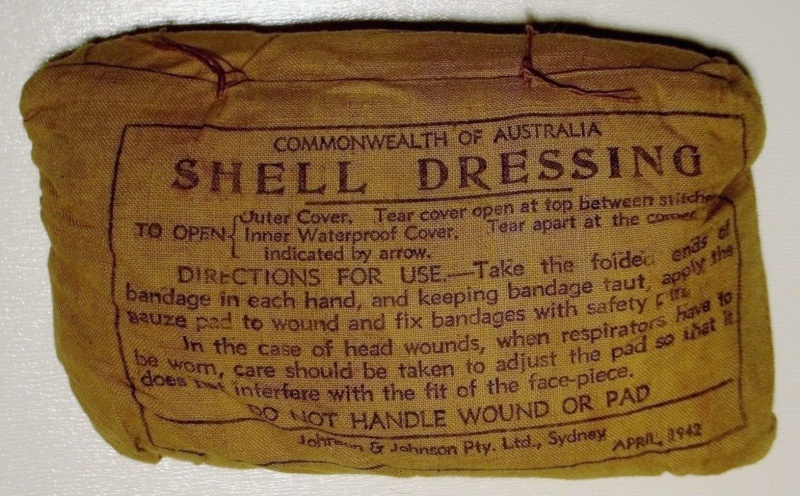 This Australian-made dressing is opened by breaking the stitches at the top rather than pulling tapes apart like the British pattern. 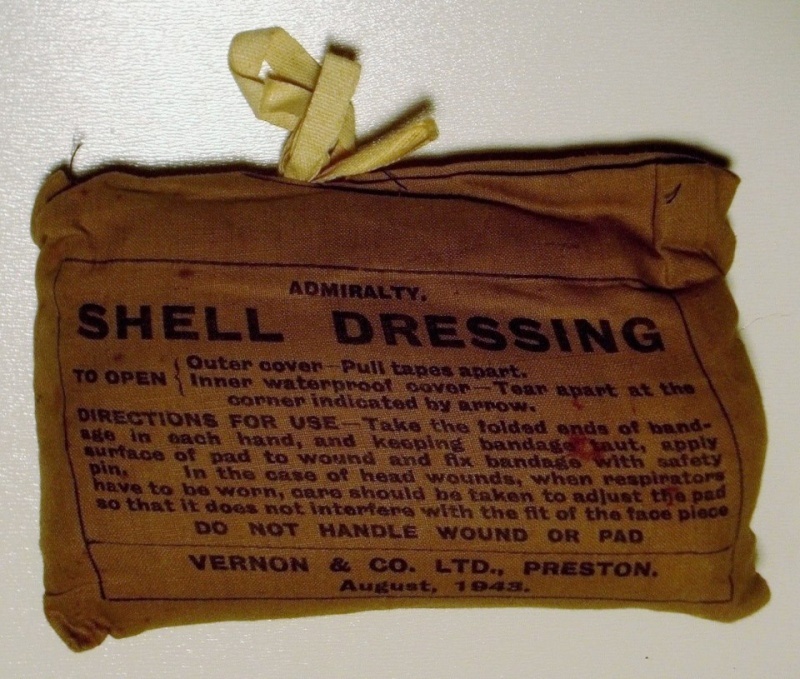 A Royal Navy shell dressing issued by the Admiralty mid-war. 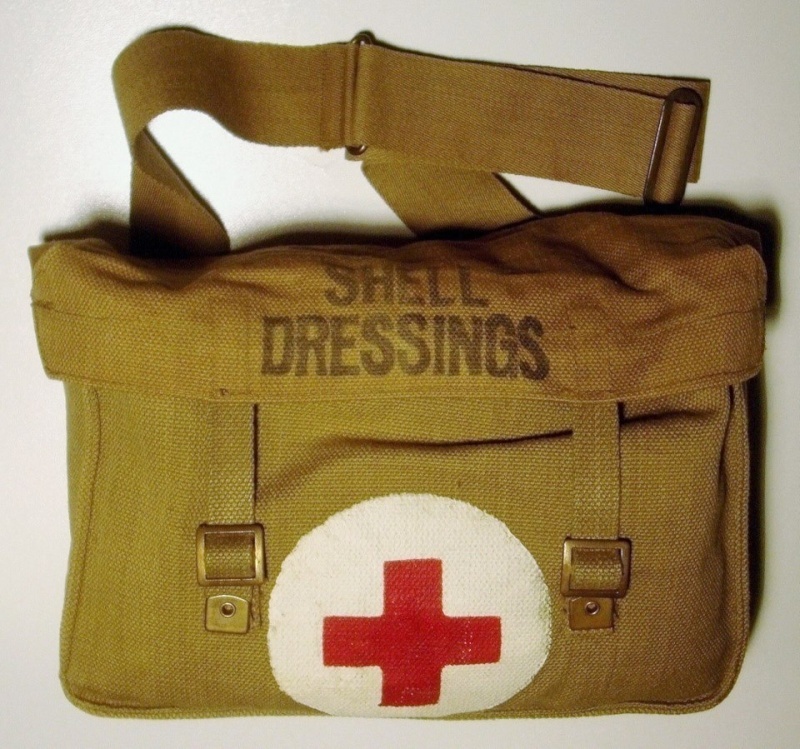 This bag was carried by medics, stretcher bearers, etc. and features an adjustable shoulder strap similar to the strap used on the respirator carrier. This example is marked A.C. (Associated Cutters) and is dated 1942. Thanks for adding to the post! Great looking dressings too! I think the Canadians stopped bothering with the outer cloth cover by 1943 and simply began printing the instructions directly on the inner waterproof cover! Waste not, want not...right?